Our Surf Lesson Plan – GRR! The BigFoot Surf Lessons Progression is based on the Gradual Release of Responsibility teaching model. GRR is a style of teaching which is a structured method of coaching framed around a process moving responsibility within the learning process from the teacher to the eventual independence of the student (You). This instructional model requires that the coach (Us), by design, transitions from assuming “all the responsibility for performing a task…to a situation in which the student or students assume all of the responsibility by the end of the surf lessons.” The Gradual Release of Responsibility model focuses on instruction that help guide students into becoming able thinkers and learners when handling the tasks with which they have not yet developed expertise (surfing). Bottom line – our surf lessons will guide you through each step to becoming an independent safe surfer. Your preparation for surf lessons is vital for a good lesson experience – please see our ‘Frequently Asked Questions’ page for detailed information as to how best prepare for your Westport surfing adventure. HINT…we do not advise eating Cheetos and Chips-A-Hoy cookies for breakfast – it’s happened, not fun results. Surfboard rentals – we recommend a 9’0 or 9’6 longboard surfboard, 8′ at the minimum, in the case of the beginner surfer bigger-is-better. Wetsuit rentals – A 5/4ml wetsuit (you will stay warm) is the best choice for surfing at Westport, with an average water temperature of 47 to 53 degrees Fahrenheit – at the least a 4/3ml wetsuit to stay comfortable. While taking a private or semi-private lesson with us we include surfboards for the duration of the lesson only. Our demo surfboards are stable and give us an advantage to delivering a desired outcome. Click Here – For List of Surfboard & Wetsuit Rental Shops. (reminder – we do not rent our gear) if you have special needs please feel free to contact us we are always willing to give it our best effort coming up with solutions to get you into the water and in one of our surf lessons. Prior to your surf lesson please be sure to check and make sure all of your rental gear is functioning to ensure a safe and fun surf lesson/adventure; check the zippers on your wetsuit and booties, try on your wetsuit and booties, check the surfboard for dings or cracks on all the surfaces but pay close attention to the rails, nose and tail of the board, check the fins and fin boxes – make sure they don’t wiggle or feel loose, check the leash to make sure that it functions and is in good condition and doesn’t look worn especially the string that attaches the leash to the leash plug, make sure you buy some surfboard wax with your rental unless it has a soft-top or is made of foam. Please note that we will be making a visual and hands on inspection of all your gear before going on our surf lesson. Our goal is to provide a safe and secure experience for you. Support Your Local Surf Shops – Click Here – For List of Surfboard & Wetsuit Rental Shops. If you have questions about gear feel free to give us a call, we’re happy to make suggestions and answer any questions you may have about surf lessons. 360-515-7969. Gear: Bring your own wetsuit or rent from us – We Provide The Surfboard! Surfboard & wetsuits for duration of the lesson only. ATTENTION: To book your lessons click on the “RESERVE NOW” button above and you will be taken to our online reservations page. You are also welcome to call us to book your lessons – we’d love to say Mahalo! 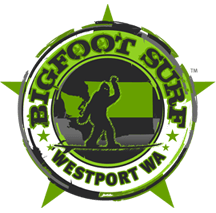 BigFoot Surf School also offers special needs, corporate or private party inquiries. Call us today 360-515-7969.